What would happen if you left your garden alone to care for itself? "My garden is planned to take care of itself and every year I try to see that it makes fewer demands, but fall planting must be done regularly if there is to be any real show in the spring." I wholeheartedly agree that fall planting makes for a great show in the spring, but I'm still thinking about how to plan a garden so it will 'take care of itself' and each year make fewer demands on my time. Looking around my own garden, I feel like it is a bit of an adolescent and a poorly behaved one at that, which so far can not be left on its own. Whenever I turn my back, the thistle weeds like the one above sprout up everywhere and if left alone, they would be four feet tall by August. 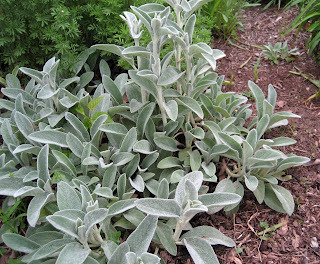 The Lamb's Ear is spreading through several areas, and would start looking quite unruly if I didn't cut back those big flower stalks regularly. This snow in summer is taking over more and more. By the way, I know that I have a Baptisia on the far left, but I have forgotten the name of the plant that the snow in summer is actually overtaking in the center there. 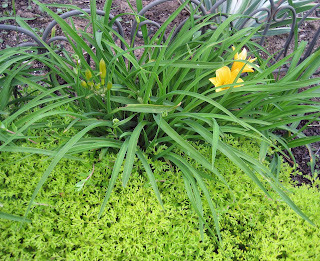 The sedum is encroaching on these daylilies. Hey, that's my first daylily bloom this year! Get back away from that plant, you spreading sedum thug. Is that a hosta in the Lamium or Lamium out of control in the hosta garden? Note to self. 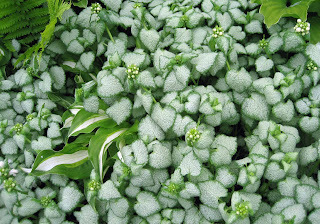 This weekend, cut back that Lamium and give that hosta some room. These daisies, left to their own devices, are taking over this perennial border. This is after I weeded out a bunch of the daisies earlier this spring. 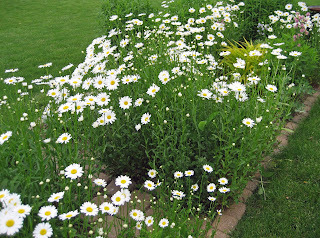 Obviously I need to be more liberal with my weeding of these ox-eye daisies, just as soon as they finish blooming. 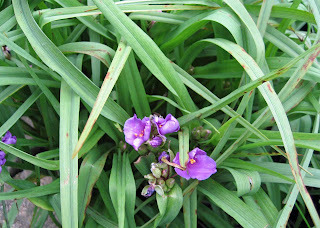 And spiderwort? Don't get me started, but when I'm not watching over the garden, the spiderwort seedlings come up all over the place. I do like to think that the lilacs bloom so fully because after the bloom is finished, I cut back all the spent blooms before seeds are formed. 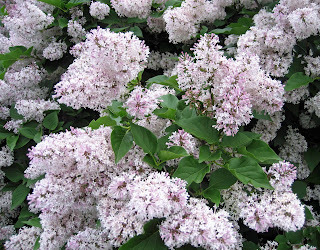 It does take a few hours to 'deadhead' the lilacs, but I think it is well worth it to get more bloom each spring. Clearly, my adolescent, misbehaving garden still needs me, which is nice because I still need it. I wouldn't know what to do if there wasn't some weeding, planting, pruning, whacking back and other "ing" tasks to do each spring, throughout the summer and into the fall. But I recognize that over time, it would be nice to have the garden be a little more 'responsible' for at least some of its care. So while I'm out there caring for it this weekend, I'll ponder how to make it a little more self-reliant and a little less demanding. The quote above is from the book Beautiful at All Seasons: Southern Gardening and Beyond with Elizabeth Lawrence, edited by Ann L. Armstrong and Lindie Wilson, chosen to be the April-May selection of the Garden Bloggers’ Book Club. All are welcome to join the book club by reading this book or any book by Elizabeth Lawrence and then posting a book review, your own insights on her writings, etc. on your blog before May 31st. Then I’ll publish a “virtual meeting” post on May 31st with links to all the relevant posts. I did leave my garden alone to care for itself when I injured my back and couldn't lift...I was miserable and the garden went wild...It partied all the time and made a mess every where. I am still cleaning up the back yard and the middle bed in the front yard. Thugs took over.....mean vicious thugs....vinca and honeysuckle. It's a lot of work to get control again. I'm afraid the thug plants would take over if I left my garden alone. Also, since I have a lot of birds visiting, I would end up with about a million wild cherry trees interspersed with blackberries, poke weed, and mulberry trees. The wind would bring me elms, maples and red bud to fill the gaps. All the rest would eventually be mint and showy evening primrose. Ha! I don't believe in such fairy tales as gardens that take care of themselves, Carol. It's funny, but Lee at The Grackle posed a similar question not long ago, inspired by a different book. I answered that my garden would quickly turn into a hackberry and pecan forest without my intervention. My garden does take care of itself but only up to a point. I try to chose plants that don't need much looking after. My south borders need very little work; some pruning and feeding in spring, very little weeding, another feed in June and some more pruning in autumn and that is pretty much it except for a spot of deadheading every now and again. Well, I've underplanted as much as I can with oxalis and other groundcovers, so my weeding chores are really minimal compared to my last garden. The big chore so far has been cutting things back regularly so they don't flop over, and watering the newest acquisitions. Luckily, other than a patch of vinca and lirope in the front bed, I managed not to acquire any thugs this year. Last year it was a constant struggle to keep the Monster Hyacinth Bean Vine Of Doom from devouring and strangling everything in its path. That said, I've given up trying to stage-mother one of my back corners, and let the coneflowers, cornflowers, and sunflowers go wild. But Mr. McGregor's Daughter gave me a great alibi-- I'm nurturing my inner child by recreating the garden of my youth! If we didn't do anything in our garden there would be chaos. Our garden would most likely turn into a hawthorn, maple and ash forest with vinca, virginia creeper, poison ivy thriving. Hard telling what kind of other invasives would come in. I am always pulling some mystery plant. In my beds the thugs have overpowered the nice plants, but some of the thugs have disguised themselves so I'm not sure anymore who the good guys are and who the bad guys are! I REALLY need a "professional" horticulturist to come and identify the "true nature" of some of the hoodlums lurking in my beds. My goal when starting my garden was to have a low-maintenance garden--no deadheading, no pruning, little weeding. Yeah, right. The daylilies should have been divided and so should some my hostas--that's on the agenda for next year. And I have the same problem with lamium as you. 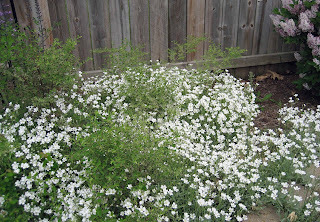 I planted it as an edging for my shade garden, thinking it would grow out, but instead it grew in crowding out some smaller plants. But my children have all grown and moved out, so I need to be needed by someone! Oh I do have so much to do with my garden. I desperately need to divide some daylily's. I keep putting it off and now have decided I will do it this fall., LOL uh right! Gardens aren't nature, even though gardeners can choose to try to work with nature. Gardens are unnatural places. Without the gardener's controlling hand they revert to nature--which humans call chaos because nature has priorities to its order that differ from ours. I think the biggest difference is that human beings like distinctions. We draw divisions--with paths, fences, or stacking and grouping like objects and plants together. Nature smudges out those divisions. Trees sprout in the flower beds, weeds crawl over the paths, vines grow up and branches fall down. Tidying up all that's fallen down over the last week in my garden makes me realize how much neatness and order brings to a garden. I'm not saying we have to be military in it (straight lines, mowed lawns, white painted rocks). But to define the garden, we draw a line--make distinction--and that's what makes a garden. I have to admit that even though you see lots of work to be done, I love the way your garden looks with everything filling in and growing together. Carol, being so shady here, I could neglect my garden for a longer period of time than someone working with more sunlight. My garden is only 4 years old, (most plants are even younger than that,) makes a difference too. My perennials compete with the maple roots for water, and so far no one is encroaching on anyone else's territory. Even though my garden is pretty large, it's not really a lot of work so far, and It's pretty neglectible, except for picking up maple helicopters, and later, seedlings, and watering. Watering in dry shade can be become quite a chore during the dog days especially. But so far in this garden, I get to enjoy looking at it more than working in it. Huh, I guess I should appreciate my garden more. . . I also have mostly slow-growing plants, very few prolific self-seeders (except the maples, mulberries, and buckthorn seedlings,) and very few weeds, maybe due in part to the heavy pine bark much I complain so much about. 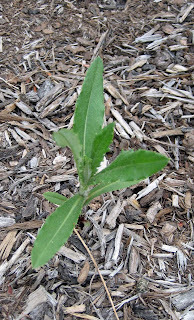 Not only does it choke out weeds, it also sometimes chokes out the perennials. All in all, I'd have to say I'm (pleasantly) surprised how little work this garden requires in order to be reasonably happy. Absolute chaos would reign in the garden. Since Lawrence gardened in the south, her fall planting is really more like our spring planting. It would be her busiest time of the year I think. I have that exact sedum, and it is eating one of my daylilies too. My entire property is my garden, and I'm slowly eradicating the grass. 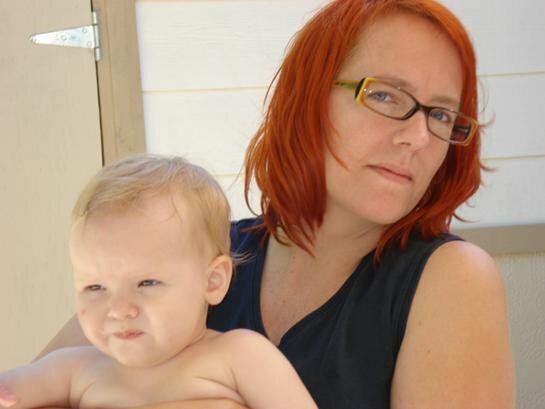 We've only owned it for 5 years, and it was rented (read: left alone) for 10 years before that. SO, I've not yet reclaimed it. If I left it alone, in short order it would be poison ivy, wild garlic, garlic mustard, Cherokee strawberry, box elder and brambles. Oh, and wild roses and wild cherry. No, I can't leave my garden to itself, but then again, I wouldn't want to. Gardening isn't cheap, but it's a sight less expensive than therapy! If I left my garden alone, it would look like my neighbor's (terribly neglected) yard. I would take a picture of this to show you as proof... but I wouldn't want to give you nightmares!!! Thanks all for the comments and different perspectives on this quote and idea. I'm glad my garden needs me! Sorry to be so late to join the party, but I've been busy taking care of the garden that doesn't take care of itself. You know those newer plastic brightly color gardening things with handles? I filled one with ripped out Lamium yesterday. So I feel your Hosta's pain. I don't think I'd like a garden that took care of itself. I'd find myself circling the garden, pruners & weeder in hand, looking for something to do.